Refined wheat flour, Rice flour, Corn flour, Red chilli powder, Gram dhal, Garlic, Compounded asafoetida and salt. Cut 150g of cauliflower into small florets. After washing in plain water, blanch in warm water for 5 minutes. Take out the florets from warm water and keep aside. 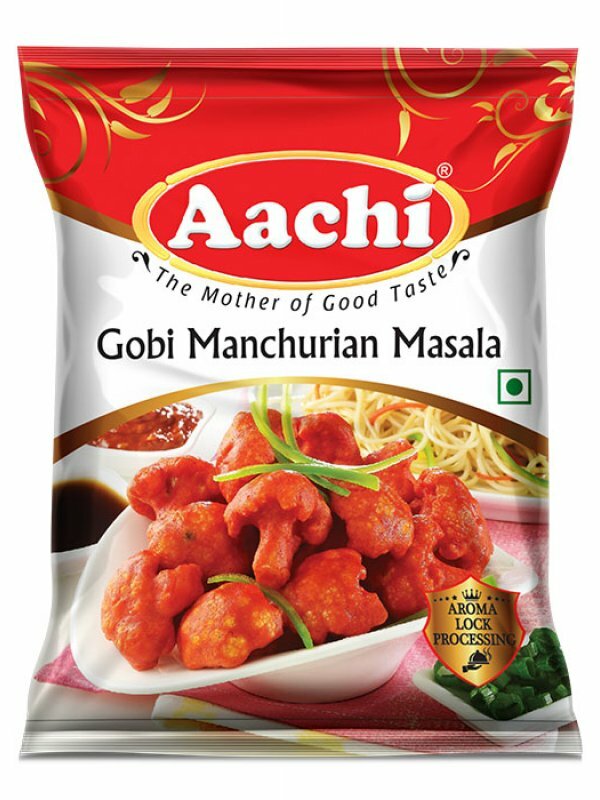 Add 20 ml water to the 20g of “Aachi Gobi Manchurian Masala”, mix well into thick batter. Add cauliflower florets, mix well and leave for 5 minutes. Deep fry on medium flame for 5-6 minutes till golden brown and keep aside. Heat the kadai with 20ml of oil, add chopped ginger, garlic, onion and capsicum saute it. Add 150g tomato ketchup and 15g of chilli sauce with salt and pepper (to taste) cook well for 2-3 minutes. Now Manchurian gravy is ready. Pour the entire content of Manchurian gravy into a pan, add the fried cauliflower florets and saute on medium flame for about 2 to 3 minutes. Garnish with finely cut coriander leaves and serve hot. Any vegetable can be used in the place of cauliflower.